Monkeypr is a two column blogger template with sidebar to its right and post section to left.The theme is designed by ajansretro and converted by me to blogger.The design is simple and it looks very stunning and purely minima style.Pages Feature ready for you.Seo for title has been done and it supports all blog features and is compatible with all browsers.Rss buttons for posts and comments also available in sidebar.Search bar also ready in sidebar. Other blogger templates you may like are Highway and dWaterdrops. 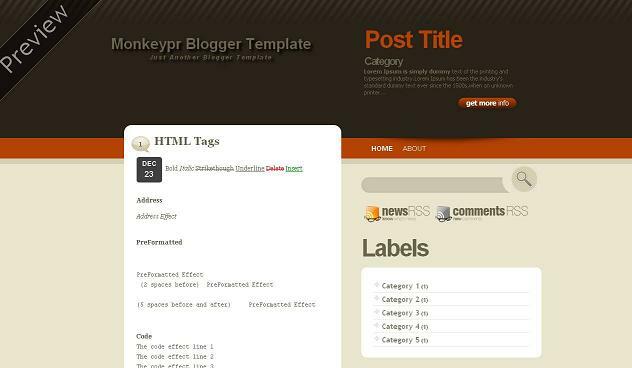 Just find for below codes in blogger html and replace with your post title, category and post description and post url. no se puede hacer mas ancho la parte de los posts y hacer otra columna??? @alzira use premium services for it. Nice template. I like 2 column blogger template. Good shearing. Thanks. @ajay ok will see over it. @Alzira premium template is the template for which you have to pay to get it or can say have to purchase the theme to use it. I really like this template and was hoping to use it on one of my new blogs. I have struck a couple of problems though. Like some others who have previously commented I find the clickable thumbnail images are not working for posts with their own images. Seems to work fine for posts with no image. Also the name of the post is not appearing on the left under the image. I am using Google Chrome as my browser. Hope you can find a fix for this. @the wizz for which twmplate yous saying there no thumbnail for above template.